Have you checked out our free resource? 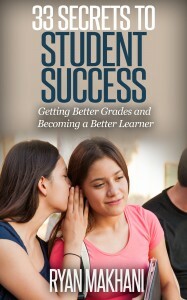 Now available for free download is 33 Secrets to Student Success: Getting Better Grades and Becoming a Better Learner. Student success is better performance, mastery of skills and content, as well as learning effectively. It is more than earning good grades – it is about being a better learner. BuildMyIdea’s free resource shares 33 secrets that can enable students to obtain better grades, learn more from classes and schooling, as well as become better learners through life.